Send me your organization's meeting, family, or class reunion notices and reports, your births and weddings, and your favorite Santa Anna sports team write ups or pictures or whatever is on your mind. Send your news items to news@santaannanews.com or use our convenient form! Thanks for coming by SantaAnnaNews.com and come back soon! The descendants of I. E. and Reba Hartman gathered at the Coleman City Park Museum on Saturday, July 28th., for their annual reunion. Winnie Blanscett, one of three surviving children of I. E. and Reba, was able to attend the reunion this year while health problems prevented Edd Hartman and J. B Hartman from attending. The day was filled with visiting, picture taking, games and the “White Elephant Auction”. Winnie Blanscett was the winner of the Hartman Heritage Quiz, with Nate Salazar winning the Mr. Grant Box Game. Door prizes of potted plants went to Hannah Hartman, Robin Bass, Stevie Hartman, Rusty Blanscett, James Bass, and Ronnie Hartman. The Candy Guessing Game winners were Gavin Walker, Stevie Hartman, Dana Eaton, and Fred Reeves. The group agreed to again donate $200.00 to the Santa Anna Cemetery Association. Everyone enjoyed a wonderful noon meal of fried chicken and all the trimmings. It is with great sadness that I tell you of the passing of Jean Culpepper. Jean, and husband Lacy, raised their nine children in Santa Anna and anyone that went to school in Santa Anna in the 60's, 70's, and 80's probably had a Culpepper in their class. The Culpepper family was known for their hard work and the children were a smart and athletic in school. Services are set for Saturday at 11:00 at the Santa Anna Cemetery Pavilion with visitation on Friday from 6:00-8:00PM at Steven's Funeral Home in Coleman. See their websitewww.livingmemorials.com for a complete obituary. Gone but not forgotten Jean Culpepper. It’s that time of year again. The 2012 Football Season is just a few weeks away from kicking off. We hope that you have enjoyed your much needed break and restful summer. We also hope that you have taken advantage of the services that were provided for you by different organizations and businesses throughout the community. The coaching staff has been hard at work planning out, for what promises to be an exciting football season. U.I.L has placed guidelines this season that will bring many changes to the way Pre-Season workouts will be conducted. This year our Pre-Season workouts will start promptly at 6:30am beginning Monday, August 6th. The workouts will run through the 16th of August, which will then lead to our scrimmage on the 17th in Rising Star. We ask that on August 6th, you please show up early to receive your athletic gear and get ready to begin our 2012 season. 5:30am-6:00am would be a great time to show up on the first day. Remember, Pre-Season workouts begin at 6:30am, which means you must be on the field at 6:30am ready to go, and not showing up to the locker room at 6:30am. Please also remember that you must provide your own cleats for the football field and flats for stations and weight room workout. These will be needed on the first day. If you have any questions, please feel free to contact us at 325-348-3137, or come by the coaching office. We are here usually in the mornings from 9am to 12pm, Monday through Thursday. We look forward to seeing you on August 6th, bright and early. Did you know that the last land battle of the Civil War was fought in Texas? Thursday, August 2, you can learn all about it at the Cross Plains Public Library located at 149 N. Main Street, Cross Plains, TX. William A. McWhorter, Military Historian who directs the Texas Historical Commission’s Civil War History initiatives, will speak about the Palmito Ranch Battlefield Historic Landmark. The Palmito Ranch Battle was fought May 12-13, 1865. 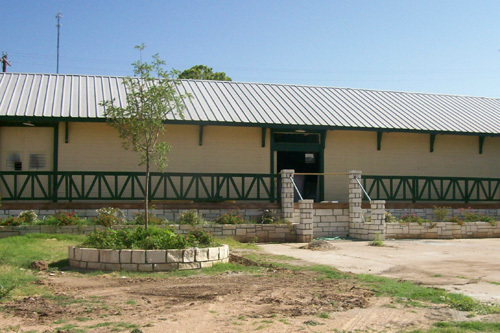 The Callahan County Historical Commission, The Texas Historical Commission and the Cross Plains Public Library invite you to learn all about this little known piece of Texas history. McWhorter will be joined by Margaret Hoogstra, Executive Director of the Texas Forts Trail Program, who will tell us what role the forts in this region played in the Civil War. At 6:00 PM the Callahan County Historical Commission will hold a business meeting and McWhorter will begin his talk at 7:00 PM. The public is invited to attend the meeting at 6:00 and/or join the discussion with McWhorter and Hoogstra at 7:00 PM. Thursday, August 2, you can learn all about it at the Cross Plains Public Library located at 149 N. Main Street, Cross Plains, TX. William A. McWhorter, Military Historian who directs the Texas Historical Commission’s Civil War History initiatives, will speak about the Palmito Ranch Battlefield Historic Landmark. The Palmito Ranch Battle was fought May 12-13, 1865. The Callahan County Historical Commission, The Texas Historical Commission and the Cross Plains Public Library invite you to learn all about this little known piece of Texas history. McWhorter will be joined by Margaret Hoogstra, Executive Director of the Texas Forts Trail Program, who will tell us what role the forts in this region played in the Civil War. At 6:00 PM the Callahan County Historical Commission will hold a business meeting and McWhorter will begin his talk at 7:00 PM. The public is invited to attend the meeting at 6:00 and/or join the discussion with McWhorter and Hoogstra at 7:00 PM. I had another quarter inch of rain from Sunday July 15th. Tex Wright reports .47 inch of rain from the rains earlier this week and I had about half an inch and one dirt dobber drowning. 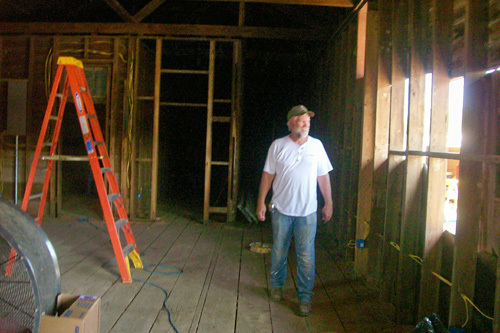 The remodeling of the Santa Anna Museum and Visitor's Center is moving right along. Subflooring has been installed, as well as the reclaiming and reinstalling of the original doors to the old Santa Anna Depot. According to construction contractor Terry Lishka, he and his crew should have the interior complete in approximately four weeks. This will include electrical work, plumbing and all finishing touches. In 2008, Care Improvement Plus, the largest chronic conditions special needs plan in the United States, launched a unique and much needed program called the “HouseCalls” initiative in which a licensed healthcare provider would make personal home visits to senior citizens who have limited access to health services. “HouseCalls” provides this one-to-one time with patients as part of the healthcare service to its members nationally without the patient needing to leave the comfort of their home. Kaye Kendall, a nurse practitioner, travels throughout rural areas of Texas in her RV visiting the homes of chronically ill seniors who may have limited access to health services or who may be homebound for a variety of reasons. With over 35 years of nursing experience and having received certification in cardiac critical care, Kaye Kendall has developed an in-depth knowledge of senior care, having helped to create national guidelines on the identification and treatment of malnutrition in elderly populations. Thirty-seven percent of rural residents do not have access to a primary care physician and nearly 70 percent of residents in these areas have limited access to public transportation, according to a recent report from the National Association of Community Health Centers. This can have a detrimental impact on the frequency that patients will visit physicians to address medical concerns. Furthermore, patients with access to primary care are increasingly frustrated by the lack of personal attention they receive. Helping re-define healthcare for senior citizens, the “HouseCalls” program provides Care Improvement Plus members with chronic health conditions, such as diabetes and cardiovascular disease the option of receiving an annual home visit from a licensed, specially trained healthcare provider, such as Kaye, who reviews their medical needs, answers health-related questions and discusses important topics to address during their next doctor’s appointment. With chronic diseases being the leading killers of senior citizens, according to the CDC, this personalized attention can be the difference between life and death. Kaye Kendall will be conducting visits in Brownwood and Early on July 11, as well as Santa Anna and Coleman on July 12. She has further visits scheduled in each of those communities from July 13 through 18. The Santa Anna Methodist Church invites all children, ages 3-12, to the 2012 VBS program, entitled "Operation Overboard, Dare to Go Deep with GOD". Dates for the VBS are July 9-13. Times are 3:30 to 6:00 each day. Registration begins at 3:15 pm on Monday, prior to the start of VBS. The Closing Celebration is on Friday, July 13, starting at 5:45, and parents and friends are welcome to come support the children. It is with great sadness that I tell you of the passing of Freddie Dodson. Freddie was a customer of mine and Cindy's for a long time. Freddie was a longtime member of the First Baptist Church and Santa Anna Volunteer Fire Department. Another good one gone but not forgotten, Freddie Dodson. See colemannews.com for a complete obituary. Come enjoy a BBQ Lunch!! Please come support the Santa Anna High School Baseball team. Santa Anna Athletes will have something new to cheer about this coming Fall semester. A new organization will begin this coming school year that will bring the athletes of Santa Anna ISD together as one. Santa Anna ISD welcomes, for the first time, The Fellowship of Christian Athletes. Coach Garcia worked very hard, for a year, to get FCA on campus. After all the applications, paperwork, and emails, Santa Anna is now a recognized FCA campus. The Fellowship of Christian Athletes is touching millions of lives... one heart at a time. Since 1954, the Fellowship of Christian Athletes has been challenging coaches and athletes on the professional, college, high school, junior high and youth levels to use the powerful medium of athletics to impact the world for Jesus Christ. FCA is the largest Christian sports organization in America. FCA focuses on serving local communities by equipping, empowering and encouraging people to make a difference for Christ. The FCA Vision To see the world impacted for Jesus Christ through the influence of athletes and coaches. The FCA Mission To present to athletes and coaches and all whom they influence the challenge and adventure of receiving Jesus Christ as Savior and Lord, serving Him in their relationships and in the fellowship of the church. The FCA Values Our relationships will demonstrate steadfast commitment to Jesus Christ and His Word through Integrity, Serving, Teamwork and Excellence. From Coach Garcia: It is very exciting. I wanted the athletes here to be able to see the wonderful things that FCA has to offer and what the students can offer to FCA. I was a member of FCA at my high school and really enjoyed it. I have a few meetings in the coming weeks with area and regional directors of FCA to get everything up and running. Any student athlete in Santa Anna from grades 7th through 12th is invited to join FCA. 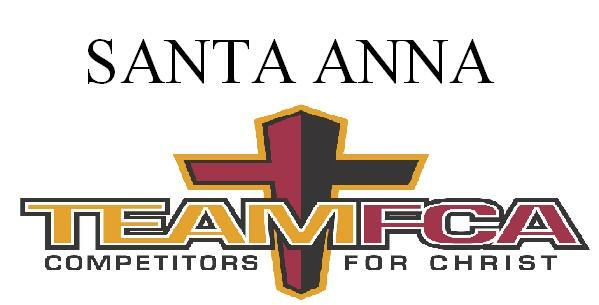 For more information, you may look up Santa Anna FCA on Facebook. The Body Shop will be offering a weight training camp again this year for all High School Mountaineer boys. Camp will be held on Monday, Wednesday, and Fridays from 6:30 am to 7:30 am. Camp will begin Monday, July 2nd - Friday, July 27th. This camp will be free of charge! If you have any questions, please call 325-348-7056. The Annual Reunion of the descendants of J.T. and Lucy Newman which was announced in the News several weeks ago was attended by 96 family members and guests. There were four of the seven living third generation members from the original thirty five. All of the attendees were enthusiastic about the new venue at Heart of Texas Resort after forty years at the old site. The children were ecstatic with the beautiful clean pool after all those years having to swim in the muddy water of Lake Buchanan. An even larger crown is expected next year. Want your own dot com? 1 and 1 is by far your best bet! Any questions just send me an e-mail and I will be happy to help you get started, or just click the 1 and 1 ad on the left, or any of the links in this article.